So much choice...just don't try to load up that Virtua Racing cart. Those of you with sharp memories will recall that we reviewed the Retro Duo console a few months back and were quite impressed with the system's power to grant new life to dusty old Nintendo cartridges. We've since been sent yet another of these "clone" systems to take a look at, but this time there's a twist - instead of just playing SNES and NES titles, the Hyperkin Retron3 also offers up the opportunity to enjoy your old Sega Genesis (Mega Drive to those of you outside of North America) cartridges as well. It's not actually the first machine to offer this three-system setup - the Yobo FC3 has that distinction - but the Retron3 has one extremely important advantage over its rival: you can use your old NES, SNES and Genesis controllers with it. Situated on the three of the console's sides are six controller ports - two for each system. The machine comes with two of its own wireless pads which are modelled on the Sega Genesis Mark II joypads, but these are pretty abysmal and should be left in the box. There's simply no substitute for using the original, authentic pads and for that reason the Retron3 scores massive points over other clone machines, which often force you to use tacky proprietary controllers. 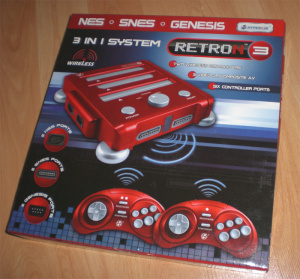 The Retron3 comes with composite cables and an S-Video cable, but sadly only the SNES and Genesis support the latter. 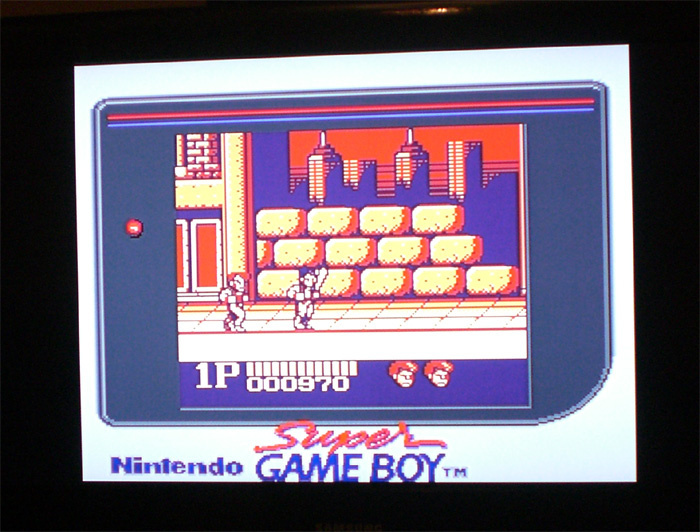 S-Video offers a very impressive picture - almost as good as the real thing running through a SCART connection - and this helps the 16-bit titles to really shine, especially when played on a modern LCD television. 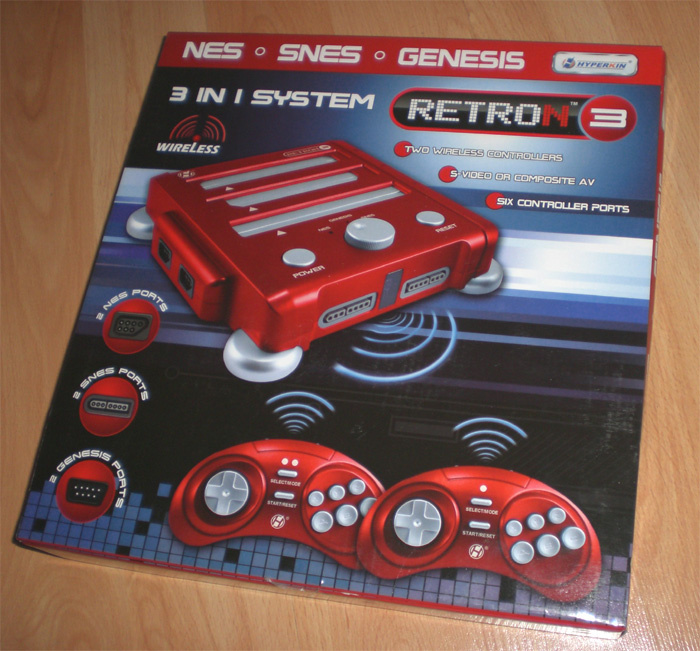 Compatibility has always been an issue with clone consoles and the Retron3 is no exception. While it's able to deal with potentially problematic titles such as Starfox on the SNES, it refuses to load up the SVP-enabled Virtua Racing on the Sega Genesis. 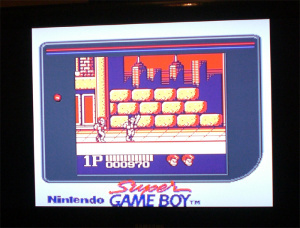 However, it does accept the Super Game Boy peripheral. Being able to access three different consoles from one base unit is a real bonus and the ability to use your original controllers ensures an authentic experience. The emulation isn't 100% perfect - for example, many NES games sound different to how they would when running on official hardware - but all things considered the Retron3 performs admirably and is well worth considering if you're sick of having three different retro machines taking up valuable space under you TV. We’d like to thank Stone Age Gamer for providing us with the review unit. The Retron3 currently retails for $54.99 (plus shipping) and Stone Age Gamer’s level of service is incredibly professional and quick. Gamers ordering from outside of North America will need to purchase a step-down voltage converter to use this system. just a few thoughts, what would happen if you had a catridge in all three slots? is there a switch to change between each console? or does it recognise what`s been put in automaticly? Geez, you guys gave it such a terrible sounding subtitle but then go on to say rather good things about the machine. @my_point_is It looks like the middle switch (the round one) is the toggle switch, so I'm pretty sure it can have all three in at once and recognize the one the switch is set at. I love these clone systems, it gives people the opprotunity to enjoy games that might not be on the VC or if they'd rather just own the carts to begin with. Does anyone out there actually own one of these? I am very interested in this especially since I own a bunch of Nes. SNES and Gensis games. The systems however I do not own anymore. Is this a good alternative to owning the actually system. I read the review but I am wondering from an actually owner point of view. Is it worth buying if the only applicable game you own is Super Mario Kart? What makes the controllers so bad? I would assume the button configuration...but it would be kind of cool to play wirelessly on this thing. I was interested in the Retro duo last year but reviews everywhere pretty much told me that sticking with the original systems is the best way to go. So yeah I'll pass on this one too. Thats the problem I have I hear mixed reviews some people have said that the ruined their games others say they work great. Some of the games that I owned have been released on the VC but others (Earthbound and Crono Trigger) havent yet and I am not sure they will be. I really dont want to deal with an Emulator on my com since I dont know of any good romsites the one time I tried a rom site I ended up getting a Trojan. Anyway I was just wondering if anyone has one of their own and tell me what they think of it. Virtual Console renders this mostly irrelevant but this looks like a pretty neat console for those who haven't made the Wii jump yet. @Gum Same here. It's neat, but my NES, SNES, and Genesis still work fine. It's definitly neat. But destroys the magic of playing it on the actual systems. This looks really tempting, but what I'm mostly interested is the SNES part. The two other systems don't really have much that I want to play, so buying this would be kind of pointless. I might just as well get the original SNES if some games that I want to play are officialy never going onto the VC. Will it take a Master System Converter? 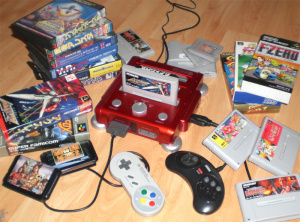 @Tasuki I own the Retro Duo and it works fine, mine even plays Castlevania 3 and Starfox (which I've heard don't always work in them) and have never had a problem with them messing up carts (or heard of it for that matter) I guess it could if you tried to switch carts with it on, but the top loading systems always ran that risk. Plus I've never had any sound issues, either. If you want one of the clones, I'd say go with the Retro Duo since a Genesis can be had for about $10 anyway. Also, the VC doesn't make these redundant for the simple reason that you can own cartridges and play them on one off these, whereas with the VC (other than paying more than MOST, not all, of the games will cost getting them at a used store or ebay) you only "own" the data as long as you own your Wii. How is this region lock wise? Nice idea, though nothing beats a (modded to 60Hz if you are a PAL person) original console. I saw a review of a cheap Megadrive clone available in the UK and its was really messed up - 50Hz, didnt even support the six button controller on SF2, even though it came with them! @5.SandMan: I think the subtitle is a joke. Looks like this system succeded where the FC3 Plus failed. That is SO on my birthday list! I'd rather just get a ( shhhh, don't tell anyone ) GP2X Wiz. Ah, the evil of emulators will always be around. the GP2X Wiz is the most amazing thing ever done. @RowdyRodimus: Well if a person decides to switch carts while the thing is on than yeah you deserved to get the cart ruined lol. Although I forget that some people out there arent use to carts and with the new gen systems you can just switch the discs without shutting off the machine. Thanks for the info I will look into one of those asap I think a vintage game store sells the Retro Duo in the store where I live. Since the last time I went in there looking for a SNES the guys told me that as soon as they get one and put it out for sale its almost always sold. They highly recommend the Retro Duo but at that time the hadnt had a chance to test it out yet so there opinion was all hearsay. Yup, it's region free. It worked with all of the games I tested - UK/US/JAP MD and SNES. As for 32X compatibility, I didn't get to try that but I would doubt it. It can't play Virtua Racing on the MD so I highly doubt it could handle the 32X. i bought this the day i seen it on this site. it arrived and it works fine though ive only played monster party for nes on it...minor glitches on the top screen but other than that so far is nice.